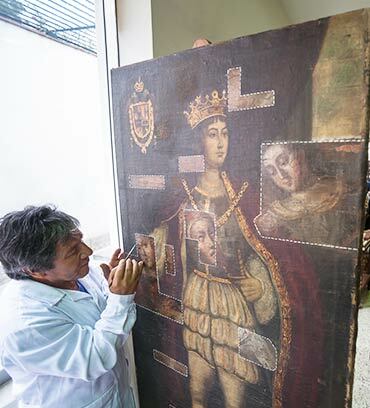 The Restoration Workshop at the Pedro de Osma Museum, established in 1981, offers restoration and conservation of artworks for private collectors and cultural institutions. Our interdisciplinary approach to restoration employs scientific criteria and contributes to the conservation of our nation’s patrimony. Throughout our workshop’s long trajectory, we have restored numerous important works. We mention here the most prestigious: the processional image Señor de los Milagros and its corresponding mural, the sculpture Archer of Death by Baltasar Gavilán, the Immaculate Conception by Angelino Medoro, and the Christ of the Descent by Pedro de Noguera.